The Perfect Fall Road Trip in Michigan! A road trip in Michigan can be downright amazing, but it requires some careful planning to do right. We're going to follow Michigan's biggest road, US 131, for this one; out of its entire 269.96 mile run, just 0.64 miles extends into Indiana. 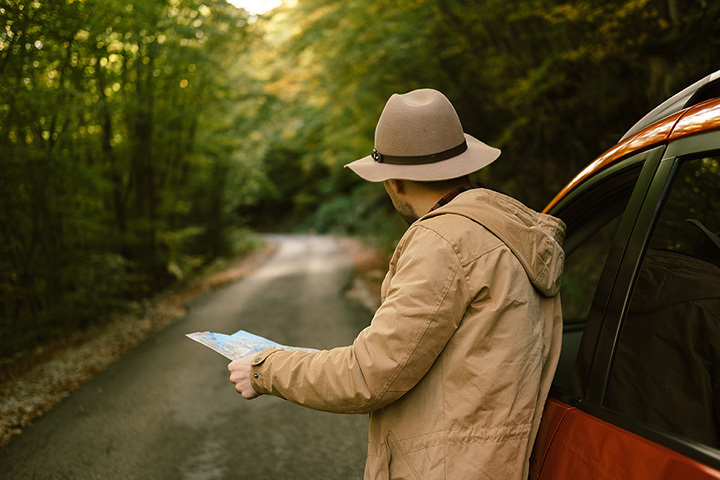 Along the way, we'll check out some scenic stops, some major attractions, and a few good places to grab a bite on your way along. So fire up your GPS and get ready for an amazing weekend with 10 great stops on a Michigan fall road trip! Start your amazing road trip with breakfast at the Country Table in White Pigeon. Near the beginning part of your trip, the Country Table is a well-known stop for locals looking for a good meal to kick off the day. With your choice of 12 different omelets—including the eponymous Country Table Omelet which includes potatoes and a coat of sausage gravy—steak and eggs, and everything served with your choice of toast or pancake, you'll have a stick-to-your-ribs breakfast that will readily hold you to lunch. Take a quick drop off 131 at Three Rivers to check out Hidden Marsh Sanctuary, a 38-acre property with simple forested trails. A public preserve, it's open dawn to dusk, so those who want to walk off some of that breakfast will be able to do so here. A variety of wood species are on hand here, and beaver have been routinely spotted in the move from the Portage River to Hoffman Pond. There's even the remains of a nursery in place, which mean some unusual trees like a Japanese spindle tree on hand. After your walk around Hidden Marsh, your next stop will take you to lunch in Kalamazoo, where the Olde Peninsula Brewpub and Restaurant is waiting. Olde Peninsula is one of Michigan's leading breweries in general, so you'll be able to have a beer with lunch. Plenty of choices await you, too, from the Haymarket Cream Ale to the “Hot Pepper Infused” beer that involves actual hot peppers. Food-wise, you'll have your choice of the simple like burgers and pizzas to the unusual like the smoked salmon poutine. Chances are you're eager for a good long hike after that burger, beer, and the remnants of breakfast, so let the Yankee Springs Recreation Area take over. Not far off from Shelbyville, Yankee Springs covers a combined 5,209 acres of ground, with over 30 miles of hiking trails available. With nine lakes on hand, there's also fishing and swimming available, though it might be a cold swim given the time of year. Still, for a long hike in Michigan woods during fall, Yankee Springs will certainly provide. In Caledonia Township, Summer Sweet Orchard stands ready to offer you a bit of a snack after your long hike through Michigan's scenic areas, featuring Michigan's favorite fall fruit: apples. With several new varieties on hand from the red, crisp Sweetie apple to the familiar Honeycrisp apple, there's plenty of options to be had here. So stop in, and check on both u-pick and pre-packaged opportunities for a taste of fall in Michigan in one of its purest forms. It's not quite fall in Michigan without a haunted attraction, and Grand Rapids is home to one of the leaders in the field: The Haunt. The Haunt has been in operation for 17 years now, and focuses on psychological horror. An interview with The Haunt's Jim Burns from 2013 detailed Burns' belief that your own brain is more dangerous to you than he could ever be, and he seeks to use that against you accordingly. So brace yourself for multi-level thrills as you go through the Haunt. You've just had one amazing day, and now you're looking for a bit of a rest. Don't worry—we're stopping for the night in Grand Rapids. But before we call it a day, we're hitting the Winchester—shades of “Shaun of the Dead”—a place with 16 different drinks on draft from the Left Hand Milk Stout to the Franziskaner Hefeweizen. Throw in red and white wines, various bottles and a slate of cocktails—not to mention food if you're hungry—and the Winchester will be the slice of fried gold you can only get in Michigan. Now, we know you're beat. We're going to get a room for the night, and hopefully you made your reservations at the Amyway Grand Plaza. The rooms here run the gamut from “historic to contemporary” and “modest to magnificent.” A combination of 1920s charm and modern-era elegance, you'll have 682 rooms to choose from. With or without a river view, or even one of the luxury suites in the 29-story Glass Tower, you'll have a staggering array of rooms, options and amenities to choose from here, allowing you to peel off your shoes and settle in for a good night's rest. For a hearty breakfast to kick off the end of your road trip, stop in to Rockford and grab a bite at that Cedar Rock Café. For reasonable prices, you can have everything from the classic Eggs Benedict to the “Uncle Sam”—a large breakfast sandwich served on a Hot Sam pretzel roll with two fried eggs, American cheese, and your choice of breakfast meat. After you’ve filled up your belly, take a drive to the Huron-Manistee National Forest to finish off your road trip. During the fall, this forest comes to life with vibrant reds and oranges. This stunning palette of colors will take your breath away.